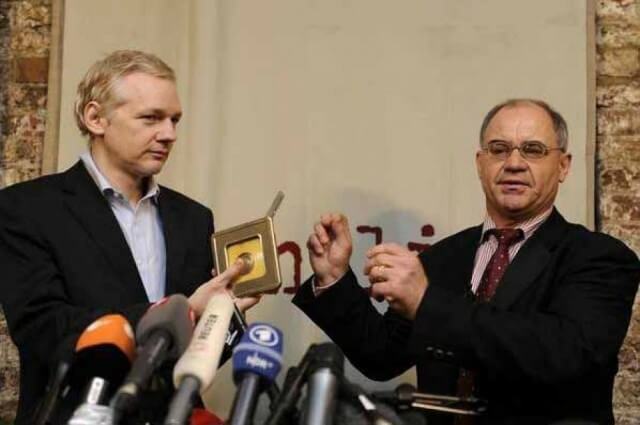 Wikileaks&apos; leader Julian Assange accepts a CD from Rudolph Elmer which reveals tax evation by wealthy clients of Swiss Bank Julius Baer, a rival of the Rothschild Bank in Switzerland. 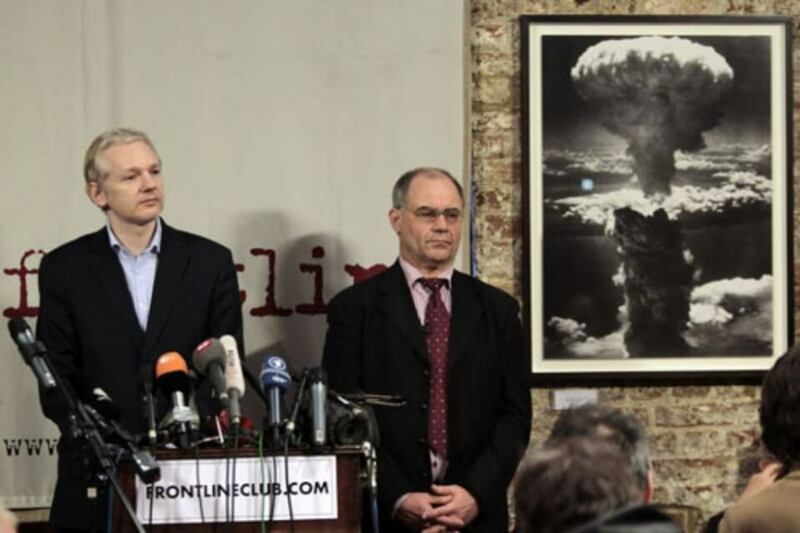 On January 17, 2011, Assange held a press conference at The Frontline Club where Rudolf Elmer, a former employee of Bank Julius Baer, gave Assange private files from the bank&apos;s Cayman Islands&apos; operation. Elmer said he wanted to expose mass tax evasion before he flies back to Switzerland to stand trial for stealing information from a bank. Although Elmer has not named the tax evaders, he claims the CD files contain information about 40 politicians, many business people, multinational conglomerates and "people who have made their living in the arts." Assange&apos;s press conference was actually a public threat to Bank Julius Baer: Wikileaks first disclosed some of Elmer&apos;s Julius-Baer material in 2008, naming ten clients. At the time, Julius Baer sued and got a court injunction to effectively shut down Wikileaks.org at its web host in California. Subsequently, the law firm Fox Rothschild represented Wikileaks, got the injunction overturned, and got Wikileaks.org back on line. Immediately, WL commenced leaking more of Elmer&apos;s documents, which was damaging to Bank Julius Baer. "He was the most important person in private banking", said a Zurich-based trader. "This is a setback for the bank (Julius Baer)", a Swiss trading analyst said. The recent imprisonment of Wikileaks&apos; Julian Assange strains credulity. His arrest by Interpol, his incarceration under draconian conditions for breaking a condom are in themselves highly unlikely events, but the timing of his imprisonment with the release of classified US cables and the campaign against Wikileaks&apos; funding and website host bear the trademarks of a covert operation. The Rothschilds are an international family of bankers at the centre of a web of wealthy families who control most the countries through a worldwide network of: privately-owned central banks (masquerading as federal banks), major news chains, trusts, councils, etcetera. An unnamed source has put their monetary worth near $100 trillion—dwarfing the net worth of the likes of Warren Buffet, Bill Gates, Ted Turner, etc. SOCIALITE, HEIRESS JEMIMA KHAN (née Goldsmith) posted £20,000 pounds ($32,000) for the bail of Wikileaks&apos; leader Julian Assange. She&apos;s genetically related to the Rothschilds and she is a sister-in-law. Her father, the late James Goldsmith—British banker, publisher–is a cousin to the Rothschilds. James&apos; grandfather Adolphe Goldschmidt came to London as a multi-millionaire in 1895 and changed the family name from the German Goldschmidt to the English Goldsmith. The Goldschmidts, like their neighbors and relatives the Rothschilds, had been prosperous merchant bankers in Frankfurt Germany since the 16th century (Wikipedia). 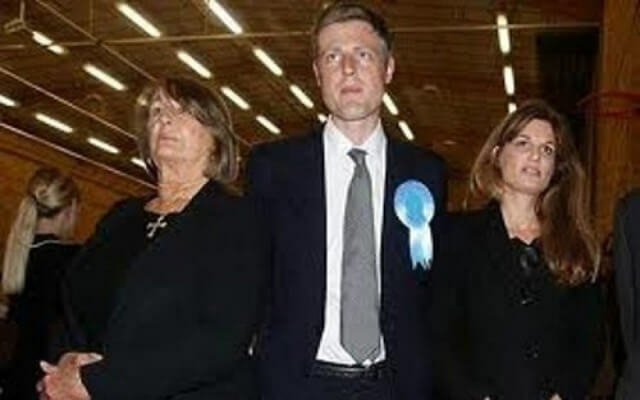 Following the Rothschild&apos;s centuries-old edict to interbreed, Jemima Khan&apos;s brother, Ben, wed Kate Rothschild in 2003 and recently her other brother, Zac, a new MP in British parliament had been having an affair with his brother&apos;s sister-in-law, Alice Rothschild (Kate&apos;s sister), up until he divorced his wife four days after he was elected MP. Zac and Alice are presently living together. Khan&apos;s brothers are marrying into Rothschild wealth. The Rothschilds began grooming Julian Assange in 2008, when Wikileaks was awarded The Economist&apos;s New Media Award. The Economist is the voice of Britain&apos;s establishment (led by the British Rothschilds) which has, for example, on balance, supported Britain&apos;s involvement in the Iraq war. Sir Evelyn Robert Adrian de Rothschild was chairman of The Economist from 1972 to 1989. His wife Lynn Forester de Rothschild currently sits on The Economist&apos;s board. The Rothschild family also has a large shareholder interest in The Economist. At first blush, it is unlikely that the The Economist, the pinnacle of the establishment, would give their award to Assange knowing full well that he was releasing classified government documents and being aware of the havoc this will create in the world. The Rothschilds&apos; oft-stated goal (over the centuries) is for a One World Government (i.e. The New World Order). To this end they engineer conflict between nations, to create crises that will then be utilized to increase the power of international entities—the UN, World Bank, IMF, etc. For example, they (and other closely-related families like the Schiffs) financed the Bolsheviks. In the past, the Rothschild empire have profited by bankrolling both sides of war. US SENATOR JOE LIEBERMAN is the Rothschild&apos;s point man in America. During the last presidential election, he took his friend, Republican candidate John McCain to Jacob Rothschild&apos;s house for a fund-raiser for McCain. Lieberman is a member of the Council on Foreign Relations (a Rothschild cabal which is essentially the shadow government of the US). Lieberman&apos;s recent actions resulted in cutting off the money supply of Wikileaks: Paypal, Mastercard, Visa, stopped accepting donations for Wikileaks. Lieberman publicly took credit for censoring Wikileaks&apos; website by pressuring Amazon to stop hosting the website. The result was that Anonymous hactivists launched attacks on the websites of companies (above) which had discontinued service to Wikileaks. Lieberman&apos;s campaign against Wikileaks had the effect of increasing the martyrdom and hence the popularity of Assange and Wikileaks. Lieberman made Assange a star, nearly becoming Time magazine&apos;s Man of The Year. Julian Assange&apos;s lawyer is Mark Stephens of Finers Stephens Innocent, a major London elite law firm. They are the legal adviser to the Rothschild&apos;s prestigious Waddesdon Trust. Assange&apos;s main media partner is The Guardian. The Guardian has been infiltrated by Rothschilds. The Guardian is controlled by Guardian Media Group whose chairman is Paul Myners a past employee of N. M. Rothschild Limited & Sons Limited. Guardian Media Group is owned by Scott Trust which became a limited private company in 2008 with all trustees becoming directors of the Scott Trust. Anthony Salz was appointed as a trustee of Scott Trust in 2009: He is currently executive vice-chairman of the investment Bank Rothschild. After a time in a real prison, Assange was "imprisoned" in a countryside mansion at the home of Vaughan Smith, the owner of Frontline Trust, a news organization that seeks to influence TV journalists. Frontline is funded by George Soros&apos; organization, Open Society Institute, and George Soros is intimately intertwined with the Rothschilds. George Soros has been a frequent business partner with James Goldsmith (father of Jemima Khan and cousin of the Rothschilds). The director of Soros&apos; Open Society Institute, Richard Katz was director of N M Rothschild & Sons for 16 years. Other board members like Nils Taube also hold positions in Rothschild banks, etcetera. On October 25 and July 27 this year, Assange was a speaker at Vaughan Smith&apos;s Frontline Trust. Most people seem to believe that current events just happen, that events in the news are chain reactions of accidents, and that people with money and power sit idly by, watching events unfold. However, The Rothschilds thrive on manipulating the markets by having insider information while propagating contrary misinformation. In this way, they make huge profits. Assange has already said that damaging information on one US bank will be released. In this fragile recovery, the crisis could be pivotal. The Guardian and the New York Times have this information so it is available to Rothschilds in order to "short" the bank before the information is released. Wikileaks is an invaluable tool for the Rothschilds to manipulate the financial markets, the whole monetary system, the future of nations, and the public. 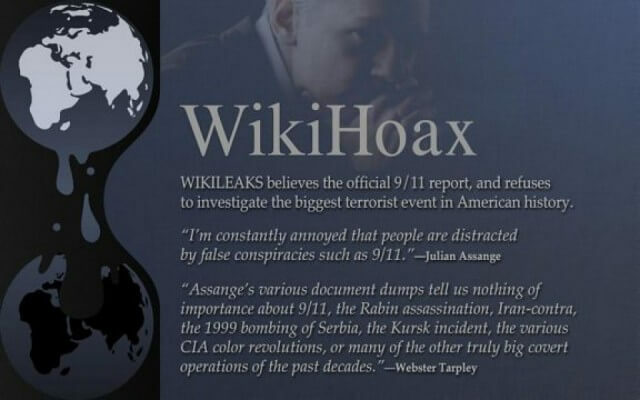 The information (or misinformation) from Wikileaks also serves the Rothschild&apos;s aim to increase conflict among nations in order to further their goal of One World Government.